We serve our own home made jams and orange marmalade at breakfast, but wanted to try something new. 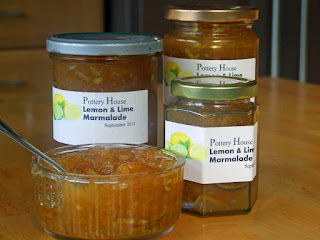 So yesterday I made up a batch of Lemon & Lime Marmalade. I'm not a great fan of marmalade but this I really like, its's got the citrus zing of the lemons and limes without the intense aftertaste you get with oranges. If you're visiting Pottery House soon and it's not out at breakfast be sure to ask Glen if you'd like to try some.